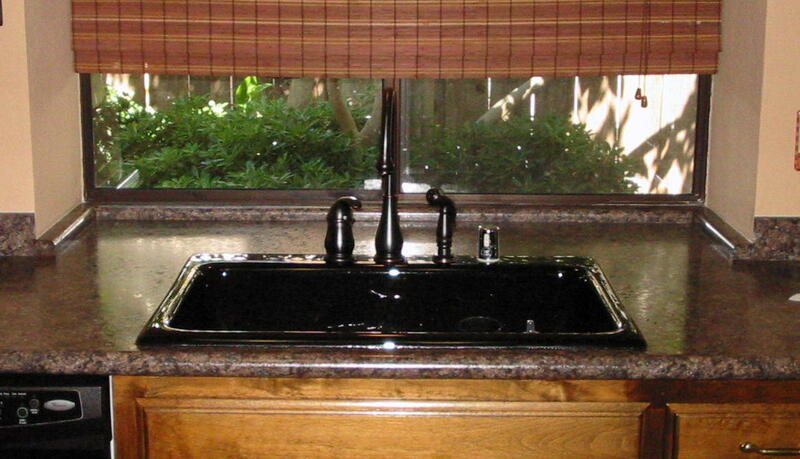 "Before you spend big money on countertops, consider all your options!" DECORATIVE LAMINATES BY WILSONART, FORMICA AND NEVAMAR. ACRYLIC SOLID SURFACE BY LG HIMACS AND LIVINGSTONE. Kitchen remodel using a decorative laminate countertop with a bullnose front edge. Variety of materials to fit your budget and style. Custom design with special edge details and splash heights. Laminate countertops can be made for customer pickup or for us to install. Typical lead-time 2-4 weeks after final measure. We are one of a small number of shops, in this part of the valley, that fabricates and installs custom laminate countertops. New bathroom vanity using LG HiMacs acrylic solid surface deck and sink. Turlock, Oakdale, Escalon, Newman, Gustine, Patterson, Merced, Ceres, Hughson, Denair, Riverbank, Modesto, Livingston, Atwater, Tracy, Salida, Manteca, Plastic Laminate.